Quantum™ Simply Cellular® Mouse IgG is comprised of four coated populations and one blank population of uniform microspheres that are approximately the size of human lymphocytes (7-9μm).  Each of the four sets is coated with goat-anti-mouse IgG (Fc-specific) with different calibrated Antibody Binding Capacities (ABC) for mouse monoclonal antibodies. The blank population has no specific binding capacity for mouse IgG. When the bead populations are labeled in the same manner as the cells to be analyzed, they provide a means for constructing a QuickCal® calibration curve (ABC values vs. fluorescence intensity), from which samples may be "read". Cellular antigen expression may thus be quantitated in ABC units. The calibration curve is also a useful means for determining instrument linearity. FCSC815A is suitable for the quantitation of cellular antigen expression in Antibody Binding Capacity (ABC) units. This product may also serve as an accurate compensation standard when labeled with the same antibodies used to stain cell samples. Quantum™ and Simply Cellular® are trademarks of Bangs Laboratories, INC.